Dogs and cats are extremely susceptible to catching fleas, as are rabbits, though to a lesser extent. The problem with fleas is that they have a long life cycle, so getting rid of the visible adults won’t necessarily bring an end to the problem – flea pupae can bide their time for years before the right conditions develop for them to hatch. Worm infestations are extremely common among dogs and cats, and can also affect rabbits that are allowed to run free in the garden. There are two types of worm that can cause problems: roundworm, passed between animals via faeces; and tapeworm, whose eggs are carried by fleas and hatch in your pet’s intestine before growing into an adult worm. Among dogs, lungworm is also a concern; found in slugs and snails, this parasite settles in the heart and lungs and can be fatal if left untreated. Children and pregnant women are at serious risk from roundworm especially, so it is imperative that you treat your pet regularly for worms – and don’t forget to scoop its poop too! Tell-tale signs include sudden scratching or biting at the skin, restlessness or agitation, and excessive licking leading to hair loss. Skin lesions and scabs may also be visible. In severe cases your animal may develop anaemia. Worms or eggs are visible in your pet’s faeces or vomit. Your pet may scratch or excessively rub its rear, and appear bloated, weak, or constantly hungry. But many worm infestations show no symptoms at all, which is why it is advisable to treat your pet regularly. How do I treat my dog or cat for fleas and worms? At Garden Veterinary Group we offer a range of prescription-only treatments that we can tailor to your pet’s needs. Some may be added to your pet’s food; others are topical, applied to the back of your pet’s neck. Do I need to treat my rabbit for fleas or worms? 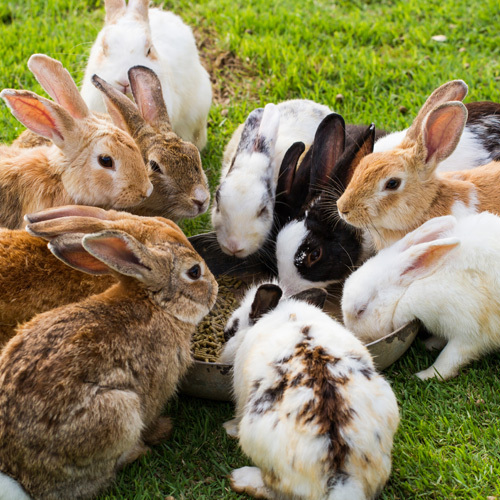 If your rabbit is allowed to run free outdoors, or comes into contact with dogs and cats at home, then it may be at a higher than usual risk of contracting fleas and worms. Speak to your vet at Garden Veterinary Group to discuss whether treatment is required.